The Gallery in Android 4.1 Jelly Bean retains its ICS looks and functionality. The Default view of the gallery is Albums, which is what we're used to seeing - it lists all folders with photos in the phone. Rather than the familiar stacks, the app uses a grid of photos, two on a line. Besides, Album view, you also get Locations (photos are grouped based on where they were taken), Times (grouped by when they were taken), People (if the photos have tagged faces in them) and Tags (these are general tags you can add manually). A handy option is the 'Make available offline' feature - it lets you easily select multiple online albums and download them for offline viewing. The Gallery app supports online albums like Picasa (but not Facebook) and you can set it to sync photos only over Wi-Fi. Inside an album, the photos are displayed in a rectangular grid, which is horizontally scrollable. When you try to scroll past the end, the photo thumbnails will tilt to let you know you can't get further. The single photo view is updated too - above the photo there are several sharing shortcuts and a delete button, while below is a line of small thumbnails of all other photos in the album. You can tap those small thumbnails to move to other images or you can just swipe to the side. The settings menu lets you do simple edits to a photo (rotate, crop) or go into a more capable editor with even more options. The editor can be accessed via a small icon in the bottom left-hand corner and offers light adjustments (so you can bring out the shadows or the highlights), effects, color styles, red eye correction, straightening a photo, sharpening and face glow (which detects faces automatically). Most of these options have a slider that lets you fine-tune the intensity of the effect. An app called Movie Studio handles video editing and it's quite feature-rich. You can add multiple videos to the timeline and trim their start and end points. You can also include titles and effects (including transitions), add music, and there are multiple options available when you decide to export the video (resolution, quality, etc.). It's a great app that can completely eliminates the need for a more powerful computer-based video editor for most people. The same goes for the image editor too. The video player is still not getting the necessary attention from Google and there's still no dedicated videos app (you have to go through the Gallery). The Asus Padfone 2's default video player lacks support for either DivX or XviD codecs. The player is quite limited in what it can do - you get play/pause and a slider to scrub through the video but that's it. Support for subtitles and .MKV files is also still missing. 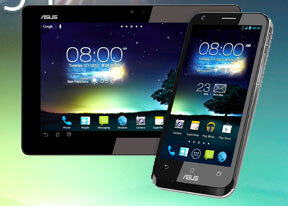 What the Asus Padfone 2 plays very well, however, are .MP4 files. It didn't think twice about playing either 720p or 1080p full HD videos. Ideally, you will be better off with one of the many alternative video players on the Google Play Store. At long last, Google implemented wireless video sharing to a Wi-Fi-enabled TV. The feature relies on good ol' DLNA technology to connect and the Miracast protocol for streaming. It's another feature most OEMs have offered for a while but it is only now that it's been integrated into the stock Android OS. The Asus Padfone 2 comes with the latest stock Music app. It has the same side-scrollable tabs like most of the other Jelly Bean apps and comes with plenty of updates. The tabs let you organize your music library - there's Recent, Artists, Albums, Songs, Playlists and Genres. From the Settings key you can get into the equalizer. It can be turned on and off and features several presets, as well a custom one. If you plug in a headset, you can also play with the Bass boost and 3D effect sliders. There are several 'Shop for artist' shortcuts sprinkled throughout the interface, which bring you to a Google search page with albums from the selected artist that you can buy from multiple online shops. There's even an option to look for nearby stores that have the album if you want a hard copy. While the player is working, the lockscreen features the album art and track info for the current song along with simple playback controls. The notification area also lets you control the playback via an expandable notification. The Asus Padfone 2 Station boasts what Asus calls SonicMaster speakers. The system comes with a specialized AudioWizard app, which lets you have different sound settings for different kinds of media: movie, music or games. We found that it does the trick of enhancing the bass of some video files. The Asus Padfone did well in our audio quality test. The smartphone posted mostly excellent scores in the first part of the test (active external amplifier), the only exception being intermodulation distortion. Still, it's not too bad and given the excellent volume levels we are willing to let that one go. 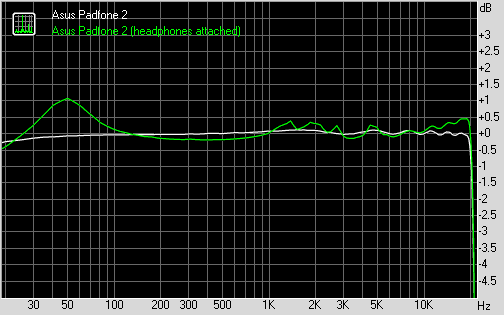 With headphones plugged in, the intermodulation distortion rises a bit more, and stereo crostalk spikes significantly. Frequency response also worsened and volume levels dropped so the performance is hardly better than average on this occasion. Check out the numbers and see for yourselves.